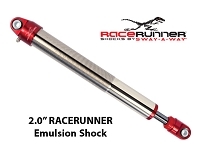 RaceRunner introduces spanner wrenches, which fits 2.0”, 2.5” & 3.0” shocks. The wrenches are heavy duty and features rounded edges for ease use. We also carry seal head wrenches for the 2.0” air shocks / air bumps and for the 3.0 threaded end shocks.